I recently traded into a couple of S&W revolvers. One is considerably older than the other but the newer one (subject of this thread) has neither MIM parts nor that darned lock. 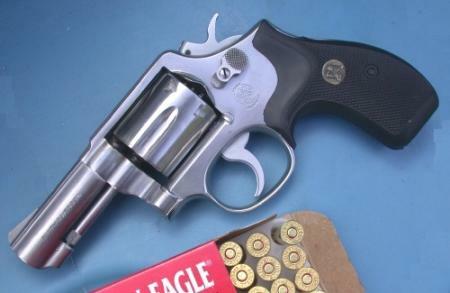 It still has the recognizable Smith & Wesson “look” that I prefer. 1. I still believe that with placement and “good” ammunition, the .38 is capable of doing what needs to be done in a self-protection scenario. 2. Fun is way toward the top of my list in shooting. The .38 Model 64 provides that. 3. Price; it was right. Looking at the ratchet, hand, and area around the firing pin hole, the gun does not appear to have been fired much at all. The action was smooth and timing was more than satisfactory. The gun has no dings or scratches and looked new…although it had been fired a small amount. The revolver came with some greenish colored laminate grips. Luckily my wife thought they were gorgeous and I “graciously” gave them to her for use on her revolver. I stuck this pair of Pachmayr “Compac Professionals” on the gun. Ugly as homemade sin, but I find them comfortable. The revolver was cleaned and something told me to remove the side plate. I’m glad I did as there was a large amount of black grease in the gun. All of the internals came out and were cleaned. A tiny bit of careful polishing here and there and a once over with Militec and I reassembled. The action was smoother and more importantly, the gun was clean. I fired 250 rounds of assorted factory .38 Special ammunition through the little S&W. Distances were 7, 10, 15, and 25 yards for groups and a bit farther (35 yards or so) at fired shotgun hulls on the berm. 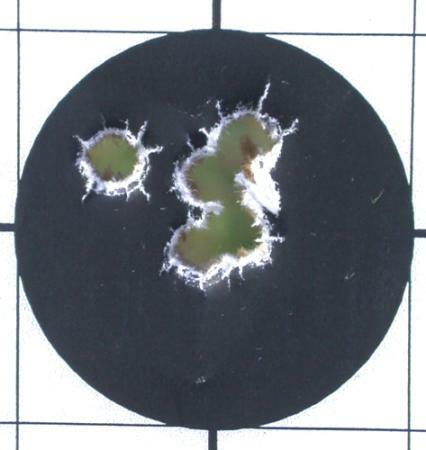 This composite was fired at 10 yards w/two-hand hold in both single and double-action. The ammunition was Federal 130-gr. FMJ. POA was the center of the bullseye. There was no effort at speed; I wanted to see if the sights were “on”. The two high shots out of the group were my fault. My eyes simply don’t see the light-colored stainless front sight and if I’m not careful, I unconsciously keep raising it to make it more visible. I also fired a few of my usual “carry load” through this revolver which does not appear rated for +P use. It will be shot some with it now and again, but will be shot mainly with standard velocity/standard pressure ammo, be it factory or handload. 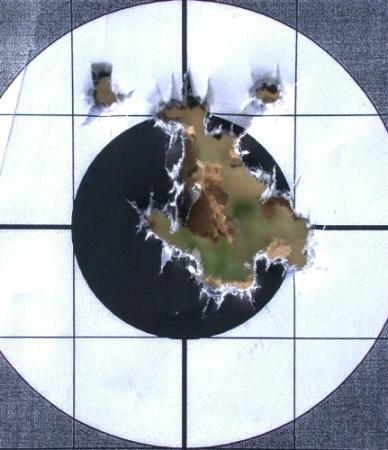 This 5-shot group was fired using Remington 158-gr. LSWCHP +P. I figured it would hit a bit higher than the lower velocity, lower weight Federal 130’s. I was right. A Six O’Clock hold was necessary to get the hits where I wanted them. I’d have preferred “dead on” but can live with this. I also fired the gun over the chronograph with what .38 ammo I could lay my hands on quickly. Each average velocity listed as well as other data is based on ten shots fired approximately 10′ from the chronograph screens. *This ammunition is no longer produced by Corbon. It uses a Sierra 9mm 115-gr. Power Jacket Hollow Point. This load hits nearly 1200 ft/sec from my Model 642 and I personally consider it too hot for alloy J-frame use. Concerned for cracked forcing cones, I do not shoot it in J-frames at all. I like it even though it might not be a majority’s choice. It is extremely easy to shoot with each load fired today. None had what I’d call excessive recoil; part of that may be due to my usually shooting my Model 642. I was pleased to see that the extra barrel length enhanced the velocity of my favored LSWCHP load by approximately 10% over my J-frame’s 1 7/8″ barrel; that gun averages right at 800 ft/sec using the same ammunition (same lot #). One-handed shooting was not difficult at all and shooting falling plates at 10 yards was just plain fun. The previously-mentioned shotgun shells were knocked all over the berm about 4 times out of each six shots; I’ll shoot the little thing until that average is better. I still believe “placement is power” for “serious” matters and think it’s more fun to hit than to miss. For a carry gun, I still prefer the Model 642 as I normally use a pocket holster. That said, this one will be loaded from now on and serve as a house gun, and as a belt gun now and then. It’s a neat little .38 and a revolver that can often be had at considerable savings over the .357 in the same condition if buying used.